In Mexican cooking, corn is eaten and drank, in just about every possible way… Esquites, freshly shaved corn usually cooked in a buttery broth with epazote leaves and Serrano chile, is one of the most popular takes. So much so, that my boys counted eight Esquite street carts in the small down town square of Chihuahua, when we were there last month. 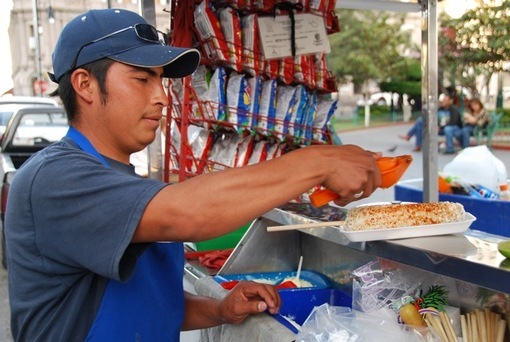 It is very common to walk through the streets in a Mexican city or village, no matter how tiny it may be, and find a wide array of street food stands boasting the dishes that Mexicans abroad hanker for the most: Antojitos, or little cravings. Each one being a Universe compounded with layers of flavors, in its own right. Esquites, as most of the Antojitos, is a very versatile dish. 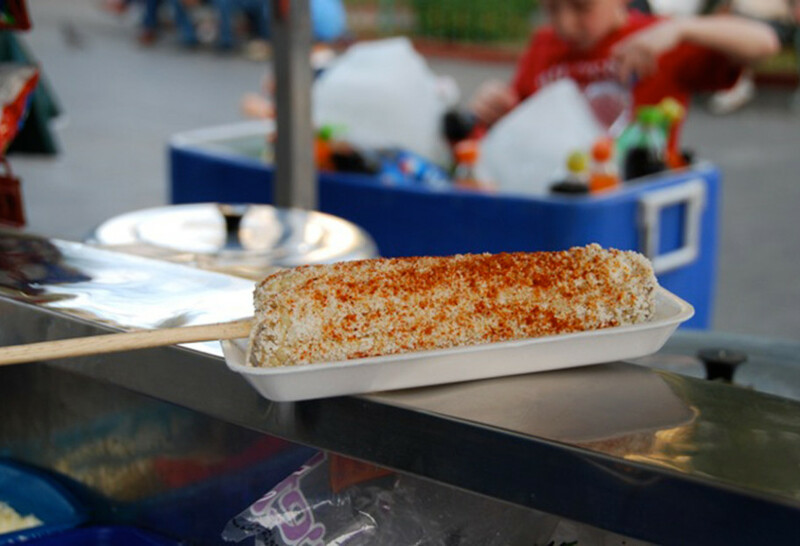 You may eat the whole cooked corn on a stick, or shaved off the cob, cooked and seasoned and served in a cup. Then, you can dress it up or dress it down according to your mood, with the traditional and complementing garnishes of mayonnaise or Mexican cream, crumbled salty Cotija or aged cheese, lime juice, salt and ground dried piquí­n chile. I just shared it last week with the Fox midday news team. My boys, of course, prefer the more hands on way of eating it, on a stick. They each have their personal spins. My middle one likes it with just butter, mayo and crumbled salty cheese. On top of that, my little one adds salt and some drops of limejuice. My oldest one proudly eats it, “with a lot of absolutely everything”… Which just means adding ground chile piquin to the later mix… but heavily loaded on all fronts. It is a good time to try it now that we start to see the beautiful fresh corn in the markets. It is up to you to decide if you want it nice and neat in a cup or deliciously messy on a stick. Melt the butter together with the oil on a cooking pot over medium-high heat. Add the chopped chiles and let them cook for about 20 to 30 seconds, moving them around. Incorporate the corn, chopped fresh epazote leaves or dried epazote leaf, water and salt. Stir it all up and bring to a simmer. Cover with a lid, bring heat to medium-low and cook for 12 to 14 minutes, until the corn is cooked but still tender. Turn off the heat. You may leave the corn in the pot for a couple hours. Serve corn in cups or small bowls. Let your guests add to their liking the fresh limejuice, mayonnaise or Mexican cream, crumbled cheese, powdered chile piquí­n and salt. You may also cook the whole corn in salted water with the epazote leaves. Once it is cooked and ready, garnish with the same ingredients. Last time I had this was in mexico city- making this today! sounds good and i am trying to prepare a garnish for corn on a stick dipped in butter then sprinkled on and what is the man and how is he sprinkling the garnish which tool is he using and i live in northern ontario and would like the garnish not so hot please get back to me thank you.